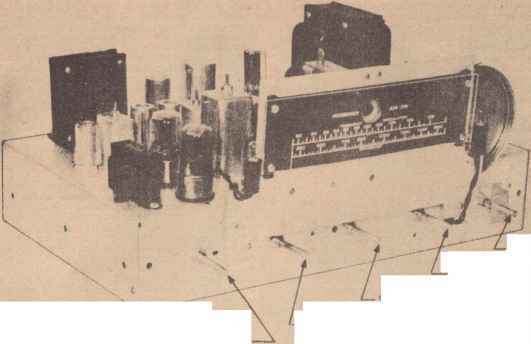 Thordarson's development of this "Dual Tone Control" was prompted by the many requests of sound men for an effective tone compensating system to boost or attenuate the bass or treble frequencies independently of each other. Examination of the schematic diagram will show that the final circuit is simple and not at all complicated to construct. It is constructed on a small chassis, making it adaptable to practically any existing amplifier. Operation is based on degeneration in the cathode circuit of a 6C5 or equivalent tube. If resistance is introduced in the cathode circuit, any signal developed by the tube will also appear across the resistance. This signal voltage is opposite in phase and in series with the voltage impressed ®n the grid and cathode of the tube. Degeneration takes place and the amplification of the tube is reduced. In this application the plate loading resistor R-6 is made small and the cathode resistor R-3 large so that a greater part of the voltage developed by the tube appears in the cathode circuit. Since the circuit is resistive, there is little or no frequency discrimination at audio frequencies, and all frequencies are degenerated an equal amount. If the cathode resistance is shunted with an inductance (of the proper value), the resistance at low frequencies is practically shorted out due to the low reactance of the choke at low frequencies. Therefore, degeneration of the low frequencies is eliminated and the greater part of the signal developed by the tube appears across the load resistor R>6. The result is an increase in the low frequency response of the circuit. Likewise if a condenser (of the proper value) is shunted across the cathode resistc*, the low reactance of the condenser at high frequencies reduces the impedance of the circuit and degeneration of the higher frequencies is reduced. The high frequency response of the circuit is thus increased. Attenuation of the low frequencies can be accomplished by shunting the grid circuit of the following stage with a choke or inductance. It so happens that the value of the choke (described above) used in the bass boost circuit also has the correct value for an attenuation circuit. The high frequencies can be attenuated by shunting the same grid circuit with a suitable condenser. The function of control R-5 is to introduce the choke CH-1 into either the cathode circuit for bass boost or the grid circuit for bass decrease. Control R-4 applies condenser C-2 to the cathode circuit for treble increase, or C*3 to the grid circuit for treble decrease. The controls are coupled to the cathode through condenser C-4 and to the following grid by a shielded lead. The small pictorial drawing illustrates fclearly how connections are made to the controls. To install the tone control unit into an existing amplifier, locate the coupling condenser in a resistance coupled stage (preferably the plate circuit of the phono or mixer stage of the amplifier, or at a point in the circuit where the maximum signal voltage applied to the tone stage grid circuit will never exceed 3.5 V. rms). Remove the condenser from the circuit and connect the shielded lead of condenser C-l and the shielded lead of C-5 in its place. Make sure that the lead from C-l connects to the plate to the tube preceding the tone control unit. Ground the shields of these leads to the amplifier to complete the ground circuit. Connect the unshielded lead to a well filtered point of the amplifier B supply circuit. A pair of twisted wires not over 3 feet long may be used for the filament supply. It is also possible to build the tone control into an amplifier if there is adequate room and care is taken not to mount the choke and controls near the power transformer. The voltage gain of this tone stage measured with the controls in normal position is approximately unity or one. Curves are shown on opposite page illustrating the tone controls in the various positions. NOTE: The brands and types specified in the parts list were used in the original laboratory models. Parts of equivalent quality may be substituted except where physical limitations prohibit.